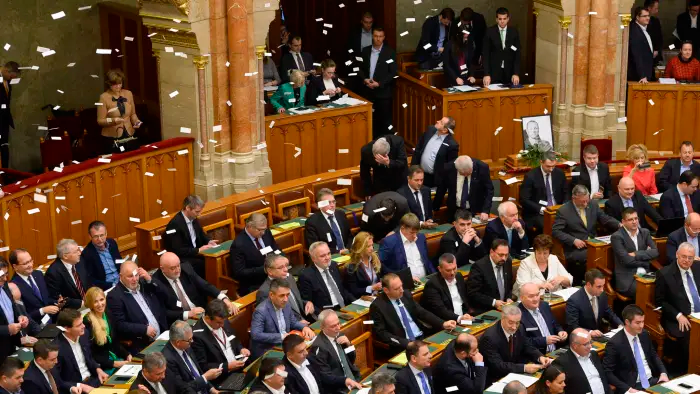 Prior to the electoral landslide that brought Fidesz to power in 2010, churches in Hungary were registered according to a 1990 law that treated all groups equally (churches being the common name in Hungarian for religious communities of any faith). The 1990 law was replaced in 2011 with a radically different law called Act CCVI of 2011. Act CCVI deregistered approximately 250 to 300 churches, while preserving the legal status of a mere fourteen churches. The Act stipulated, further, that in the future only Parliament, through a two-thirds vote, could bestow legal recognition on churches. These draconian measures provoked an international outcry, and responding to pressure, Parliament quickly expanded the list of registered churches to thirty-two. That, of course, still left hundreds of religious communities without legal status. In 2014, the European Court of Human Rights ruled in Magyar Keresztény Egyház and others v. Hungary that Hungary’s church law breached the European Convention by violating the right of religious freedom. The Strasbourg court objected both to the process of recognizing churches through parliamentary vote and to the deregistration procedure. The court also singled out for censure discriminatory provisions in the law related to Hungary’s church tax. In Hungary, taxpayers can donate 1% of their income tax to a Recognized Church. Deregistered churches, not being churches, have not been permitted to collect church tax. Since the church tax supports faith-related activities, permitting some religious communities to collect church tax, while preventing others from doing so, amounts to religious discrimination. The severity of the European Court decision appeared to catch the Hungarians by surprise. Government legal theories notwithstanding, Magyar Keresztény Egyház v Hungary made clear that a major overhaul of the church law was needed. A year later, in 2015, the government submitted a new draft law to Parliament. The bill contained a three-tiered classification system, consisting of Religious Associations (vallási egyesület), Listed Churches (nyilvántartásba vett egyház), and Registered Churches (bejegyzett egyház). Membership in each classification would be determined by courts according to objective criteria. At the same time, the bill included provisions for so-called cooperative agreements between the state and specially selected religious communities. Meanwhile, the protracted years with no legal redress were exacting a heavy toll on Hungary’s deregistered churches. “Deregistration,” in fact, is a euphemism to describe what happened to them. Deregistration did not mean their names were simply removed from a registry of official churches. Deregistration meant they were stripped of legal personality and placed in a legal no-man’s land in which they had no rights. According to OSCE/ODIHR Guidelines on the Legal Personality of Religious or Belief Communities, deregistration is an extreme measure, to be taken only as a last resort in response to “grave and repeated violations endangering public order” (Guidelines 2014, paragraph 31). Hungarian deregistration was never targeted against criminal groups; it was a blanket procedure integral to the implementation of the law. Consequently, some deregistered churches were forced to shut down schools or abandon charitable work; others were evicted from rental properties after having their leases abrogated; others were harassed by the tax authority. Most egregious of all, deregistered churches were notified they would face “winding down” procedures, that is, liquidation, unless they applied for legal status as a civil association. In creating a tiered system, the Hungarian law gives the appearance of being modelled on other tiered systems in Europe, perhaps those in Germany or Austria, which conform to European norms. Those norms require that the state adopt an impartial and neutral posture toward religion, but do not necessarily preclude differential treatment. According to OSCE/ODIHR Guidelines on the Legal Personality of Religious or Belief Communities, “The State may choose to grant certain privileges to religious or belief communities,” provided that, “they are granted and implemented in a non-discriminatory manner,” and that “there is an objective and reasonable justification for the difference in treatment.” (Guidelines 2014, paragraphs 38, 39, 40). Thus, after a superficial read, the Hungarian church law might appear typical for Central Europe. Closer examination reveals this is anything but the case. The different tiers in the Hungarian law disguise a thoroughly arbitrary treatment of religious communities. As compared to the old, the new law actually expands the role for government discretion in the treatment of religion. In this respect it is arguably more discriminatory than before. To understand this requires working through a number of perplexing conditions for membership into the middle tiers. To become a Listed Church a religious community must have been operating in Hungary for at least five years or be affiliated with an international religious organization operating for 100 years. In addition, the religious association must have received church tax from at least 1000 individuals in three preceding years (2011. CCVI törvény 9/D § 1a, as amended in 2018). This latter condition, however, cannot be met by any deregistered church, because all deregistered churches have been prevented from collecting church tax since 2011 – the ruling of the Constitutional Court, notwithstanding. A similar condition applies to religious communities seeking to become Registered Churches, which need to have received church tax from at least 4000 individuals in the previous five years (2011. CCVI törvény 9/E § 1a, as amended in 2018). In short, to move out of the bottom tier into which they have been placed by deregistration, deregistered churches must meet conditions they cannot meet because they have been deregistered. This highly perplexing condition is also thoroughly discriminatory. To require religious groups to forgo economic privileges in order to receive specific legal status violates international norms for religious freedom. According to OSCE/ODIHR guidelines, “measures discriminating against [non-traditional religions and nonbelievers], such as measures restricting eligibility for government service or according economic privileges to members of the state religion or predominant religion…are not in accordance with the prohibition of discrimination based on religion or belief and the guarantee of equal protection.” (Guidelines 2014, paragraph 41). the legislator specifies additional rules applicable to religious communities with a legal personality that do not wish to receive aid for their faith-based activities or public purpose activities from budgetary sub-systems, EU funds or from programs financed pursuant to an international agreement, whether in the context of a tender or not, on the basis of a special decision. These communities are eligible to be classified under a higher category based on the certified number of their members – a thousand members in the case of Listed and ten thousand members in the case of Registered Churches – instead of certifying donations from personal income tax. This allows religious communities that do not wish to cooperate with the state the option of obtaining church status. (Proposed amendments to the church law submitted in November 2018). Furthermore, while the transitional provisions impose impossible burdens on deregistered churches, they exempt currently Recognized Churches from any transitional burdens at all. Recognized Churches simply carry their current legal status over into the new law. This is so even though a majority of Recognized Churches do not appear to meet the conditions necessary to acquire status as a Registered Church. According to data provided by the state tax authority, only thirteen of thirty-two Recognized Churches received church tax from more than 4000 people in 2016 (NÁV kimutatás a 2016. adóévi szja 1%-ának). Based on the conditions enumerated in the new law, they would not qualify as Registered Churches unless they can demonstrate 10,000 members. Yet if they do have 10,000 members, why were they not asked to renounce all means of financial support before advancing to the highest tier? This entry was posted in articles, Feature article by Principium. Bookmark the permalink.